ST. LOUIS — Get the latest 5 On Your Side forecast here. Thursday will bring some spring-like weather to the St. Louis area before we get hit with a one-two-three punch from winter. Temperatures are mild Thursday morning in the 40s. We’ll see highs near 60 by the afternoon. Thursday will be mostly cloudy and breezy, but by the evening, we may get a few light showers or sprinkles. The timing is 6 p.m. to 10 p.m. After that, it’ll remain mostly cloudy and stay breezy overnight. 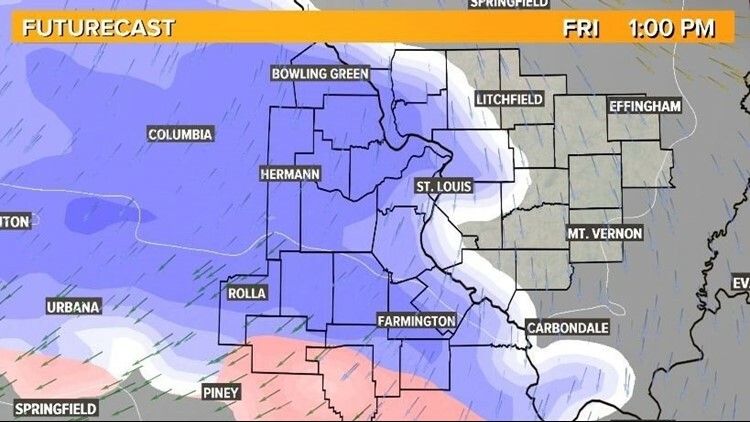 The first of two weekend snow systems will move into the St. Louis area Friday. The wintry weather may start as sleet and snow around lunchtime in the metro area. Areas south could see freezing rain and a wintry mix before it all switches over to snow. It’s looking like the snow will continue through the overnight hours. Expect a potentially messy drive home Friday. 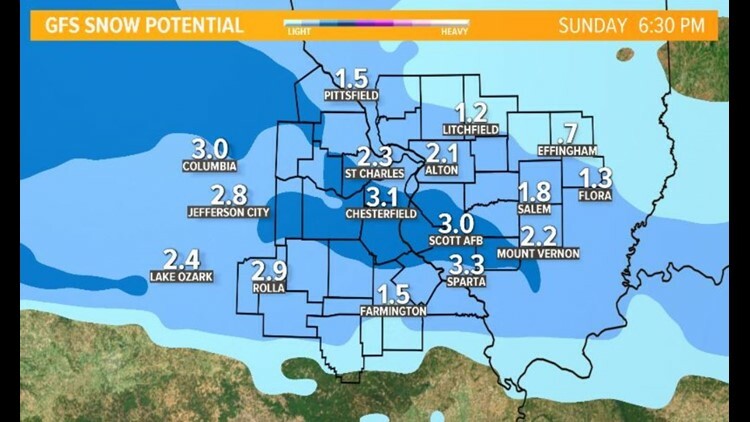 We’re expecting anywhere from 1 to 3 inches of snow by Saturday morning in the St. Louis metro area. It’ll be a cold start to Saturday with that fresh blanket of snow. We’ll see partly to mostly cloudy skies with highs in the lower 30s. The second round of snow is expected to arrive by Saturday evening. We could also see some sleet and freezing rain with this system. Right now, most of the heavy snow looks to fall to our north, but the metro St. Louis area could get another 1 to 2 inches of snow. Snow will continue overnight into Sunday morning before winding down Sunday mid-day into the afternoon. Monday is expected to be quiet before a third wintry system moves in Tuesday evening into Wednesday. This looks to be a rain/snow/freezing/sleet event. The exact timing and path of this is not yet clear, since it’s so far away. We still have other systems to get through before that one even forms, but models are hinting at more accumulation here as well… so stay tuned!